Love most of what this controller does, but I’ve been thrashing with what seems like an obvious requirement that is just escaping me. Occasionally (for example, to inspect all of your emitters to make sure they are functioning as expected), it is desirable to manually run a complete schedule (eg several zones with predefined watering times). 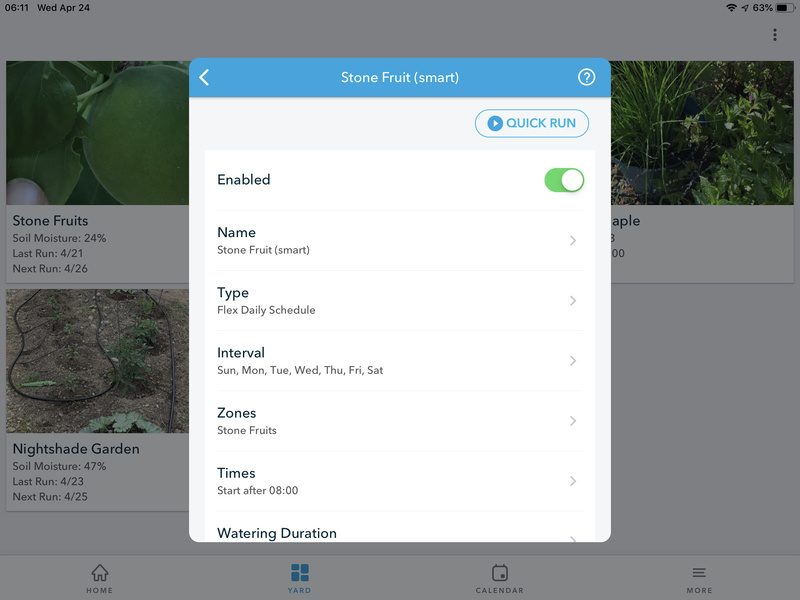 As far as I can tell, the Quick Run feature requitres me to manually enter the appropriate watering time (if default 3 minutes is insufficient) for each zone…settings I’ve already made when I created the schedule. Am I being dense or is manual schedule run just not supported? Most of the automation here is great. Love the remote control and record-keeping, but some acknowledgement of basic maintenance requirements and ad hoc watering needs would help. Hope someone can assist??? If you go to the schedule tab and tap on a schedule, there’s a Quick Run button at the top of the schedule settings. That particular Quick Run button should run the full schedule — it has worked for me at least for schedules with one zone. The quick run button at the home screen, for me, does require entering a time. Hey, Rachio friends…why not include a bit more info on the Quick Run button so context is maybe spelled out for dense people like me…“Quick Run a schedule” and “Quick Run a zone(s)”? Maybe other contexts, too? Not sure how many there are. I second the request to rename the home page button to “Quick Run a Zone(s)” and the button on the schedule page to “Quick Run a Schedule”. I’ve only owned the Rachio for a couple of days. It took me a while to figure out that they functioned differently. I’m still learning about the Rachio, but I like what I’ve see so far. Very cool product! The Quick Run is an awesome feature. It seems like it was designed just like the 2 min test as they use on many of the older Irritrol controllers. 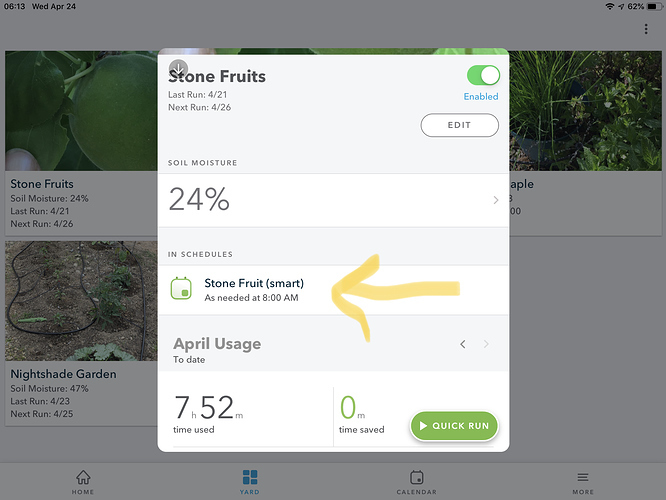 The 3 minute default run time makes more sense anyways as some of us encounter more drip irrigation zones and it takes longer to inspect those as is. A good feature to add in, would be an advance to the next zone button so that those of us that do often sprinkler checks would be able to move on to the next zone without having to wait for the full 2 or 3 minute countdown. Just some food for thought on the next upgrades. Haven’t used it in awhile so I could be wrong but isn’t there a button at the bottom to advance to the next zone in the Quick Run mode from the front screen? Kind of like the “advance track” button in a Music app. Ahhh. Yes. I did forget about it in that mode. Thank you for the reminder. Sorry to dig this one back up but I just stared using the Rachio this spring and already my first scheduled run was cancelled (due to 11% chance of rain? hmmm). I tried to run it anyway, but all I get is the “quick run” you mention. Unlike zone quick runs, this one does not prompt me for a time and simply waters 5 minutes each zone. This is a grow-in schedule - I need to run the schedule for its allowed time and don’t want to re-run for 5 minutes at a time. How do I simply run the schedule as its set, not as a dumbed-down demo? You’ll need to go tap the Yard button, then tap the zone that has the schedule you’re interested in, then tap the appropriate schedule listed under that zone under “in schedule”. Quick Run button should appear at the upper right corner on the schedule screen.